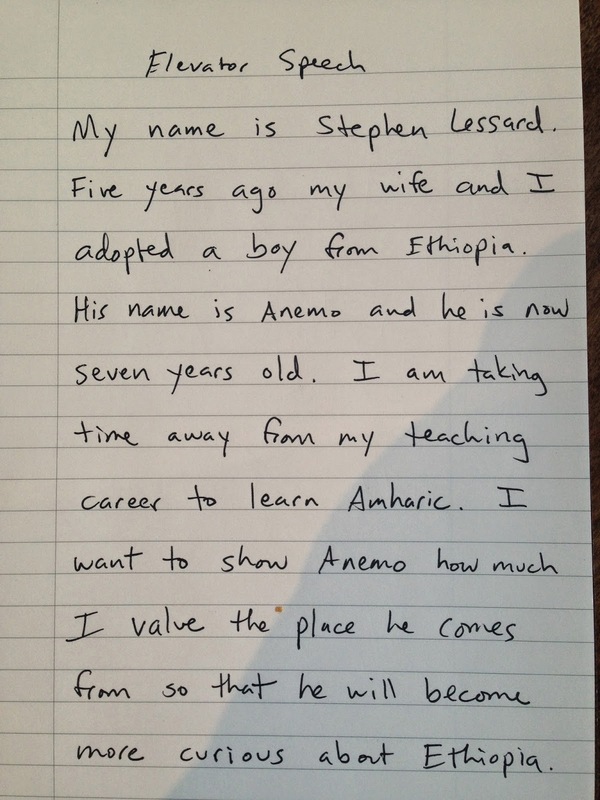 It reads: "My name is Stephen Lessard. Five years ago my wife and I adopted a boy from Ethiopia. His name is Anemo and he is now seven years old. I am taking time away from my teaching career to learn Amharic. I want to show Anemo how much I value the place he comes from so that he will become more curious about Ethiopia." This contains all the basic information I want Amharic speakers to know about me: my name, my profession, my marital status, my Ethiopian son, and at least one of my motivations for learning Amharic. I realize that by emphasizing my motivation to increase Anemo's interest in Ethiopia I run the risk of undermining any personal benefit to learning Amharic. Yet I really do believe Anemo's future as a bicultural person is my primary motivation at the moment. We'll see if that's enough to sustain me. I don't ride in many elevators these days, so I don't know if "elevator music" still plays in them. But I did recall that kind of ambient, background effect when Jan recommended I listen to YouTube videos featuring Amharic speakers. The idea is to just have the audio playing in the background while occupying myself in other ways, subconsciously absorbing the sounds of the language, its melody and rhythm, contours and cadences. I love the idea of making progress while doing other things. There are many interviews in Amharic on YouTube. And there are plenty of men's voices. The one problem is that the interviews are mostly recorded from radio, and the interviewee is typically speaking through a phone, so the fidelity is not great. No matter. When I found an interview about 40 minutes long, I put it on a speaker and commenced doing other things. First I played Temple Run 2 for a while, figuring that such a mindless game would leave my brain free to take in the language, but looking at a screen didn't make sense. I stare at a computer too much already. Then I decided to just take a short afternoon nap on the couch with our dog Softy. That was much more pleasant, and the language, despite its irregular, jerky rhythm, became quite soothing after a while. Maybe it was due to Tamrat Layne's calm, subdued voice. The former Ethiopian prime minister spent 12 years in prison for corruption and embezzlement, so I suppose he had plenty of time to mellow out. After dinner I listened to that interview one more time while Anemo built one of the Lego sets he chose yesterday for his birthday and while I folded clothes into piles around the dog. Folding laundry is the one activity that I really believe, under the right conditions, could drive me out of my mind, so I was glad to have a higher order brain activity (though subconscious) going on simultaneously.